The Bohol Environment Management Office (BEMO) of the provincial government admitted difficulty in running after illegal miners. BEMO Technical Staff Leonilo Lafuente told the Chronicle that it has been difficult on their part to really put a stop on the illegal mining activities, especially when the operators are elusive, such as those coming from other provinces. He said they had been conducting a series of information, education campaign (IEC) but they continued to struggle in convincing those coming from outside Bohol to cooperate. He said most of the miners in Bohol are from Davao. “Although sige ta’g IEC didto pero, kasagaran sa mga manguykoyay kay di taga diri, mga taga-Davao. So wa silay kaugalingong . . . So isa na sa mga problema nato na,” according to Lafuente. He also said that they have monitored small-scale mining activities which are more rampant and which the government agencies are oblivious about. He explained that quarrying of small-scale have a maximum area of five hectares. The provincial government issues the permit through the BEMO. 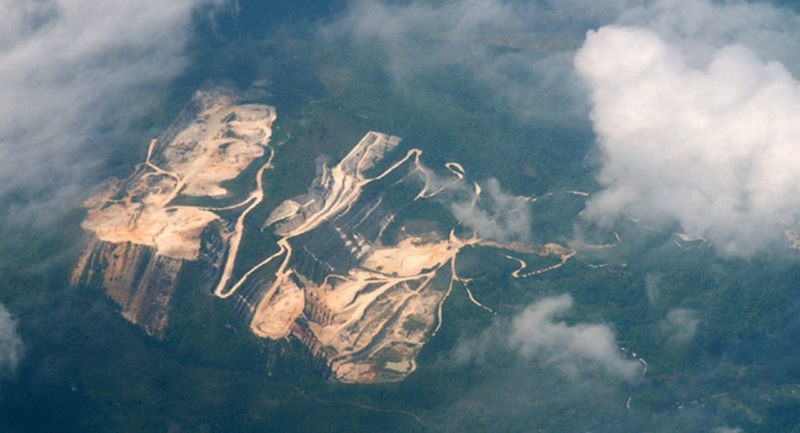 An example of a large-scale quarry or mining in Bohol is the one in Garcia-Hernandez on which the BEMO has no control. “Wala mi hold anaa. Pero motan-aw mi kung in place ba or maayo ba siya pag-managed. Mao na ang amoang monitoring,” Lafuente explained. He said the mining in Garcia-Hernandez is under the national government. “That operation has been approved sometime in 1980s pa na siya. And, during that time pag-approve anaa, wala pa ang BEMO. Kay og naay sayop anaa nga mga atung mga prediction, mga possible impacts nga sauna pwede nato i-discuss. Wala pa man ang BEMO, according to Lafuente. He said the Philippine Mining Service Corporation in Garcia-Hernandez has a 25-year contract with the national government and renewable for another 25 years. In 1995, the company had renewed their contract. On the other hand, illegal mining had also been monitored in Talibon and Trinidad for its rich metallic mineral resources such as gold deposits. Lafuente said until none from among the small-scale gold miners in Trinidad and Talibon had applied permit, and thus, these activities are illegal. “Until now, wala pay maka apply og small-scale nga mga mining permit. Kasagaran diha mga nagkuykoy-kuykoy lang ba. Murag Diwalwal style ba,” Lafuente said. These small-scale gold mining in these areas are not regular, but Lafuente said there are times their team would chance on some men digging tunnels. He said the BEMO team had already repeatedly advised them to form a cooperative and apply for a Minahan ng Bayan to make their activities legal. Once they have legalized their activities, they would be made to follow some conditions both for their own safety and for the environment, on top of which is public safety. They would also be given some technical advice and inputs to improve their operation, but at the same time they would be asked to pay taxes. Lafuente added that there are actually many quarry activities without permit and this is a problem facing Bohol. He elaborated that the provincial government or the local government is mandated under the Local Government Code of 1991 or RA 7160 to enforce the law. “RA 7160 mandates local government officials to institute measures to safeguard our environment. Na klaro kaayo na. Mao nang gikan sa kagawad sa barrio, kapitan ngadto sa gobernador as long as naa sila sa local government units, they are mandated to perform environmental management functions. So mangutana ta, how will we enforce the law on mining or quarrying?” Lafuente said. He said it’s not only quarrying, but also sand and gravel extraction, while some are even extracting from caves. Kanang sa mga sapa diay o? kanang mga manguhag mga bato, mga stones or gravel. Kini siya, and even extraction in the caves. Magkuha og mga minerals like guano or phosphate. Apil na sila, covered na sila sa small-scale mining or quarrying,” according to Lafuente. He explained that the provincial government can only act as complementary entity to DENR as the primary office. What is authorized by law is to observe the limit not to exceed the allowable volume as prescribed in the national policies or national laws. “Mao nang ang provincial government, through its initiative, ang Sangguniang Panlalawigan, legislated a so-called Provincial Mining Ordinance. Any violator nga nahisupak sa provision sa Provincial Mining Law or mining ordinance will be penalized,” according to Lafuente. He said the penalty for first offense is P3,000, while for the second offense is P5,000, and the third offense is constraint and other sanctions. “Adto nato ipasang-at ang iyang mga formal charges pero mura bitaw siyag lax ra nga baluad no? Mao nang daghan pa na’g mag-abuse. Kung gusto gyud ta nga ma-penalized gyud siya’g maayo nga mutagam gyud. Mapriso ba kaha siya og way swerte,” Lafuente added. The complaint will be endorsed to the DENR for filing of appropriate charges which is theft of mineral, although it is the BEMO who would apprehend. Lafuente also elaborated that the provincial ordinance was approved, although there had been amendments along the way, during the administration of former governor David Tirol sometime in 1993 or 1995. He said that, in fact, the BEMO had already apprehended several violators since then. The penalties from apprehensions had contributed to the local revenues of the provincial government. He explained that in one operation, there can be more than one penalty that could be imposed – first on violation on the allowable volume, then there would be another penalty for unaccredited loading. The consolidation of the penalties raise revenues for the provincial government, according to Lafuente. He said what concerns him are the repeated violations as violators had become creative in avoiding the third offense.